An eclectic collection of goodies, if you can find them. I believe some would make great KS reprint/update candidates. Any takers? 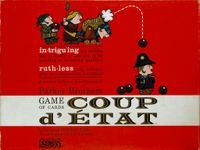 #10 -- A terrific game for up to four couples, and a great ice-breaker for social events, youth groups, etc. Whoonu does it better and faster, but that is for single players, not teams. #9 -- variable setup with 3D pieces, little treasure chests that reveal either treasure or cobwebs. Fun for kids of all ages. 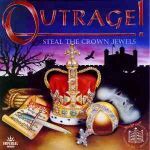 #8 -- When we bought this at the Tower of London, we also bought a very nice miniature replica set of the Crown Jewels which we use with the game. Great fun (yeah, even though it is not a great game) and brings back many great memories. #7 -- Between that cool oil derrick and being able to lay a pipe line to siphon off your neighbors' production, what's not to like? Make a reprint rethemed about fracking and think of all the free publicity you would get! #6 -- I played full NFL seasons of this, keeping score, in the 60's. So much better than the silly vibrating field version of Electronic Football. #5 -- If you like trick-taking games, this is a MUST! Six different games AND a scoreboard/pegboard that features metal daggers as the pegs. Get over to eBay and get yourself a copy. #4 -- That sinister/sarcastic voice telling you your time is running out adds to the suspense and pressure. #3 -- A truly excellent euro with GREAT wooden bits, including a cathedral that makes Pillars of the Earth's look like a chapel. Lots of interaction in this one: should you try to burn your competitors' huts or bribe their knights or fend off attacks -- or save those cards to win auctions? #2 -- The sliding tiles that change the map (including a tile exiting on one side of the board only to reappear on the opposite side) keeps you on your toes. Great wooden bits and ripe for an edition in English. #1 -- Dudes on a space map, only BETTER! The planets and asteroids all rotate around the Sun at different speeds, and space ships can slingshot around the sun. Each planet's genetic creatures have unique special abilities. Each planet has a character/leader with a unique ability that joins the majority controller of that planet. And BGG has version 2.0 rules you can download for free. KS a Legacy version anyone?